I awoke thinking about my father, Spaceman Carter. Before closing my eyes the night before, I made a list in my mind of the priorities in life. I fell asleep feeling like a clone of my father. Dad was a strong and loving influencer. He was driven by his desire to take care of his family; lend a helping hand; respect, observe and learn from nature; be healthy in order to enjoy each day to the fullest; learn something new each day; be part of the solution and not part of the problem. He loved flying, gardening, walking, running, camping, writing, playing games, solving problems, creating things with his hands, sailing, staring up at the sky, sleeping under the stars and finding beauty in the ordinary. I realize I’m not the only one who missed my walks with Dad. There are people around the world who had joined us on our walks by following this blog. I still go for walks. My father, in spirit, joins me. I apologize for leaving the rest of the world behind. I decided to breathe life back into this blog at least a couple of time each month by sharing some of my walks, the ones walks during which my father is most present and I’m seeing the world as he taught me, by example, to see it. It was too sad for me to add to this blog as it was titled: Walks With Dad. I obtained a new domain name to bring a fresh life to the blog with as much joy as I did to the original posts. I invite you to follow our adventures together once again. We now walk on just two feet rather than four. My heart carries both of us. Our journey continues … together. The story really begins last Friday when I stuffed Dad’s marigold-colored corduroy pants into a plastic bag without checking the pockets. 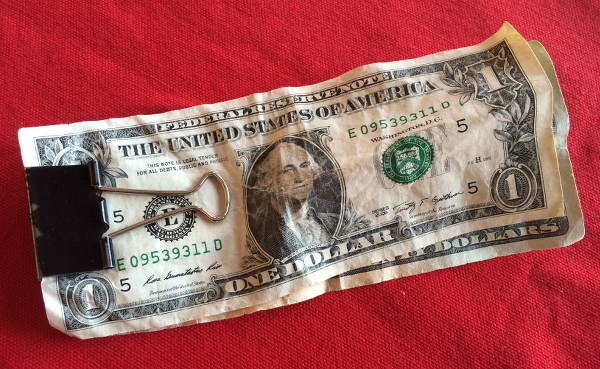 Later that night I found Dad’s clip, still holding his Twenty-one dollars, at the bottom of the washing machine. It is the same twenty-one dollars Dad has carried around in his pocket for at least three months. He lost several silver money clips about a year ago and switched to the basic stationery clip. Usually, he switches it into a pocket of clean pants after a shower. The room key was part of the ritual until it vanished many months ago. I knew Dad wouldn’t need money for anything: I let Jane know I had both his pants and his money so she wouldn’t worry about them if she noticed they were missing. My normal day to visit is Thursday. Hardly anything is normal anymore. I had to go this morning or not at all this week. I opted to go this morning and drop off the mop and bucket I bought to help keep our shoes from sticking to the bathroom floor. I arrived a bit before 11 am. Dad was asleep in his chair, as usual, a cup of coffee beside his chair. Coffee in a cup and saucer, not a disposable cup. Dad must have made it to breakfast for a change. He got up out of his chair, quite easily for a change. I gave him a big hug. Dad always says he is wonderful. “I’ve been writing about it, hoping to figure things out. This is not good.” He sat back down in his chair. I noticed that he looked alert; he looked present; he looked like the Dad I feel I lost a while ago. He began to tell me the story, in great detail, of the previous twenty-four hours. He and Jane had attended a President’s Day Event at Washington Crossing Camp Ground, an event that Dad had always participated in prior to his dementia. At one point during the day there had been a small admission charge for something. Dad had reached into his pocket for his money clip and found he had only empty pockets … ALL of his pockets were empty; no money, no keys, no credit cards. He panicked and told Jane he didn’t have any money. She reassured him that it was okay because she had his money. He was totally baffled. He hadn’t remembered giving Jane his money. He didn’t sleep last night, worrying. He couldn’t believe that his memory was gone, that he couldn’t remember important things. He tested himself by naming his children; Louise, Ann, Chris and David. He tried naming his grandchildren, but couldn’t. He tried naming his children’s spouses and wasn’t sure if he got them right … or not. As he was searching his brain for names, he thought of Jack Law (his former brother-in-law) and wondered what had happened to him. Dad’s new “validating” money roll. Dad remembered all sorts of other things, too. He remembered his table mate, Tom, reminding him to try to get to meals on time. He remembered Howard hanging up the plane above his chair. He remembered that the house he and mom built was now two stories high and that the family has three sons. He knew that the little watercolor on the wall across from his chair is one I did from a photograph of Louise and Ann at Virginia Beach when they were very young. Dad had been shocked by his empty pockets. He didn’t know how he could be totally broke. I remembered the stories Dad told of the farmers in Indiana always having a huge roll of bills in their pockets. Perhaps having money in one’s pocket validates one’s existence. Just then there was a knock on the door. It was Rita, coming to get Dad to join in the hall walks. She noticed something different about Dad. I gave her a short explanation of what I had learned from Dad over the last hour. She, too, is thrilled. She will have Meaghan check Dad out to see if the new cognitive program might keep things going for a while. I couldn’t stay very long and wanted to make sure Dad showered. “i showered this morning, Chris …. I KNOW I showered this morning. I realize I’ve probably told you that before without really knowing, but this morning I DO know.” A huge grin spread across Dad’s face. After washing the bathroom floor, I joined Dad in the dining room. I wanted to do cartwheels when I walked through the door and saw Dad chatting away with Tom and John. Both Tom and John had looks of surprise and pleasure on their faces. “Your Dad’s been telling us an amazing story. He says that today is the best day of his life. It’s certainly must be true. He hasn’t said a word to us for months and he is back to his old self.” On Friday, the conversation had only been between three of us; Tom, John and me. Today, there were four people participating and Dad had more to say than the rest of us. At least three other people came over to chat, happy to see Dad alert again. When we returned to his room, I asked him if he thought he might want to write something about his experience. “I certainly do! In fact, I had planned to go out somewhere today and buy a pad to write on, but then I remembered that I have this one and I think it is much better.” He lifted a few books and pulled out a sketchbook that he had been given to him but he hadn’t used. Today was the first time I have seen Dad initiate anything on his own. Today, he initiated dozens of things on his own. Awakened from a long, winter’s nap. I hope that his awakened state will last long enough for Jane and Anna’s family to have a wonderful, 92nd birthday dinner with Dad tomorrow night. Dad, today was one of the best days in my life, too! Thank you! I love you. A splendid day with Dad! I arrived earlier than usual. He was asleep in his chair ( no surprise), and immediately perky and pleasant when he awoke. Without any trouble at all he gathered clean clothes and disappeared into the bathroom for his shower, shave and shampoo. I’m not sure he shampooed, in spite of me cracking open the door and reminding him. 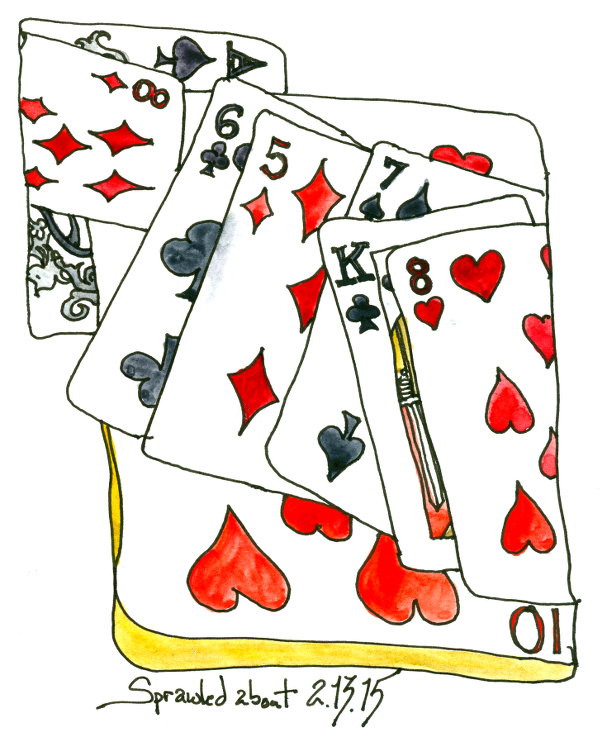 I hardly had time to scribble a drawing of Dad’s playing cards before he stepped out of the bathroom clean as a whistle. We played two games of Rummy 500: Dad won the first game and I won the second game. He played remarkably well. Rather than play a third round, we bundled up and drove to the market to pick up treats for his sweetie! Dad picked out the best card ever. He amazes me. I love him. An amazing day with Dad! I didn’t have enough energy and patience to try playing Rummykub with him, but I was determined to get him to write again. Typical resistance to taking a shower … no surprise. When he came out of the bathroom wearing a clean shirt and smiling, I was ready to challenge him to writing a few words. My only hope for success was to have him draw something first. 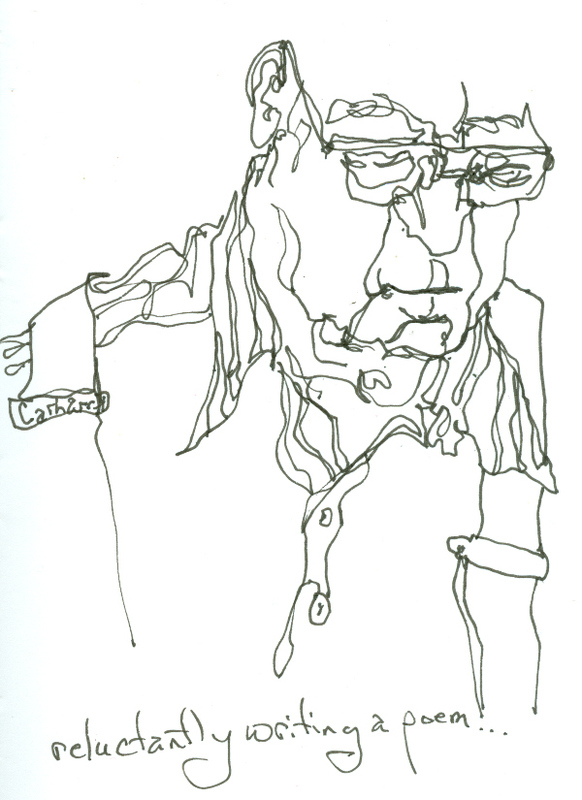 For whatever reason, drawing allows him to access his reservoir of words more easily. 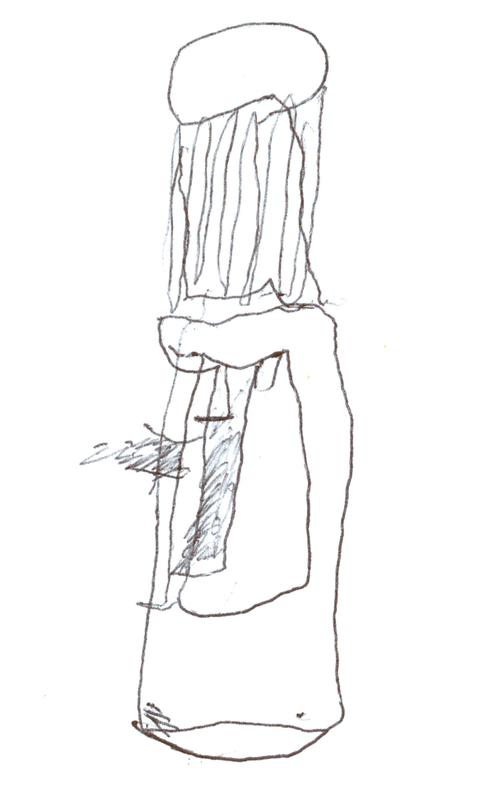 he chose to draw the bottle of cough medicine with the disposable dosage cup turned upside down over the cap. Certainly not a drawing that one might see hanging in a gallery, but that wasn’t the goal. When I asked him to try writing a few words, there was no hesitation, no resistance, no excuses. Dad picked up the pen again and started writing. I didn’t care what he wrote … he was finding words to write on the piece of white paper! I thought I might never see that happen again. “What battle, Dad?” I asked. After expressing my delight in the words he found, I apologized for being such an ornery daughter. Only fifteen more pages to go and Dad will have filled his green sketchbook with words and a few drawings. I thought for sure, after a month of not being able to get him to write at all, the pages would never be filled. You can’t imagine my joy. All I need is energy and patience and the pages will be filled. It’s that time of year again, time to decorate Dad’s room at Chelsea for the upcoming holidays. While Dad showered I unpacked the ceramic Christmas Tree that Jane had carefully wrapped and stored in a box with the garland of red ornaments. I hung the garland on the lamps and set the tree up on Dad’s card playing table. 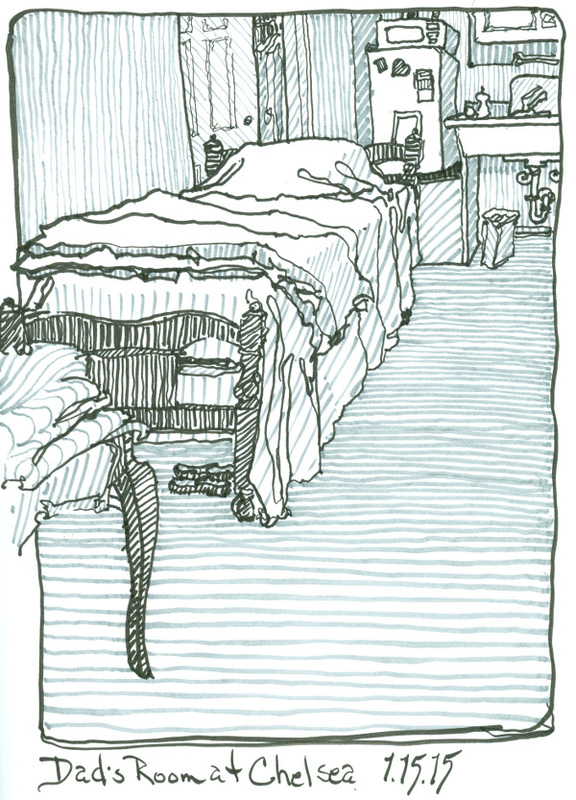 Even after straightening up his room a bit, there was time for a quick drawing before Dad rejoined me, fresh and clean. 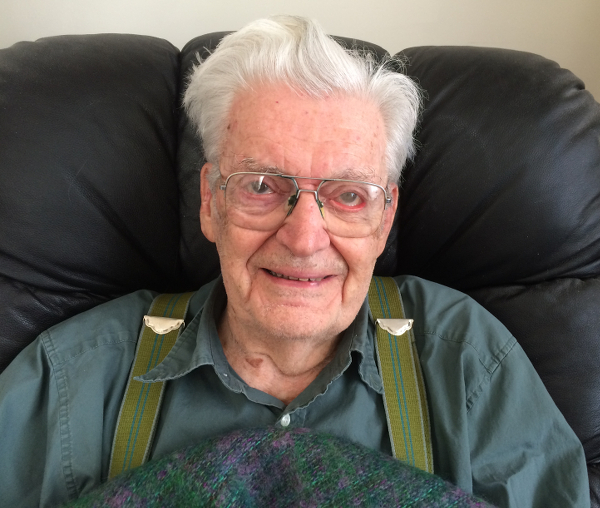 Each time I visit with Dad, I learn more about how a brain processes information. Before playing cards, I asked Dad to write a poem. Expecting the normal response of being told that one needs to be inspired to write poetry, I suggested he write a poem for Jane that I could put into a Christmas card for her, a special gift from him. He surprised me by immediately picking up his pen and writing quickly in his green book that I had placed on the table in front of him. Much too quickly the task was completed. He put down his pen and closed the book. I had suggested he write something I could put in a card for Jane. That’s exactly what he did. I decided to try again. He took a little longer this time, but not too much longer. a H A P P Y New Year !! Once again, Dad struggled to read what he had written. 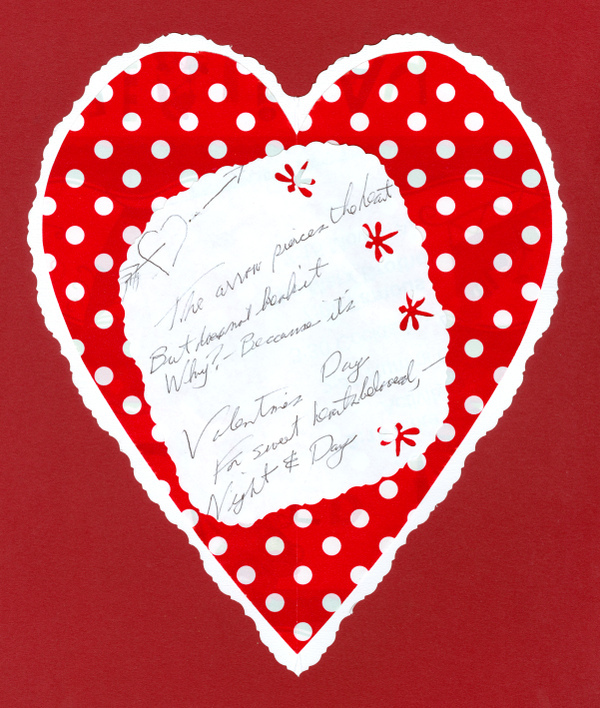 His second try was a cross between a greeting card message and a poem. One more try…..
Well, do tell, do tell. Dad closed the green notebook. I shuffled and dealt the cards. My heart was smiling. 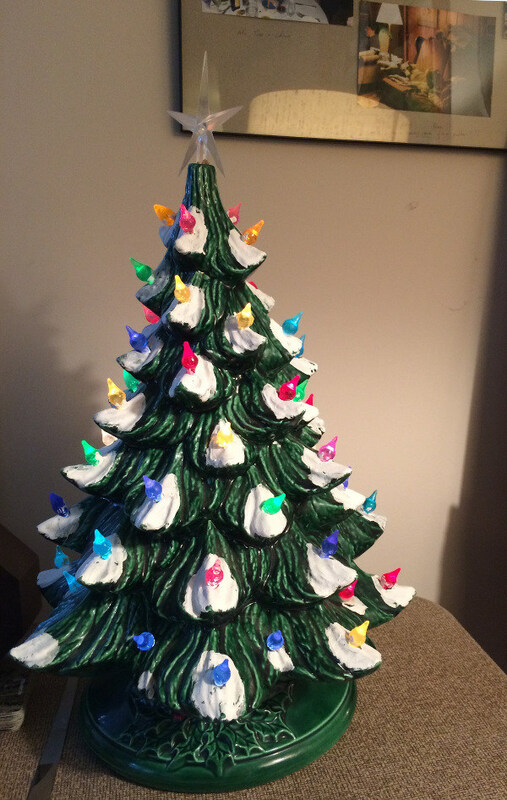 When Dad walked me to the door to wave goodbye, we searched the Chelsea Christmas Tree for his ornament. 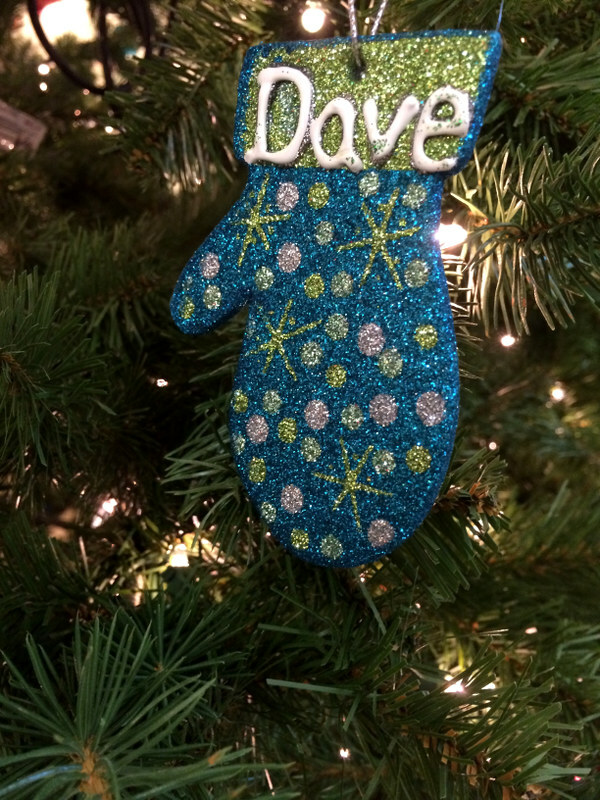 Each year the staff makes an ornament for each of the residents. 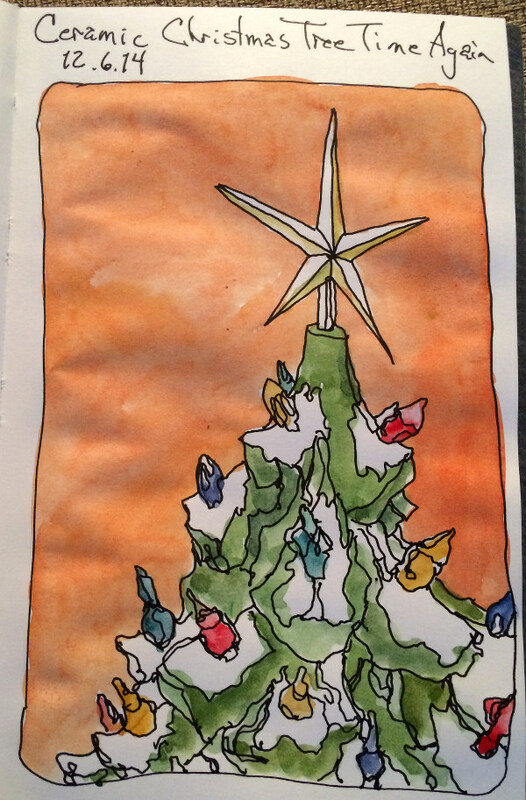 Tis the season to be jolly…. and that’s NOT willy nilly. Today is Wednesday. Usually, I visit Dad on Thursdays. Due to poor connections and even poorer baggage tracking technology, I need to be home tomorrow. Lucky for me, I visited Dad today. 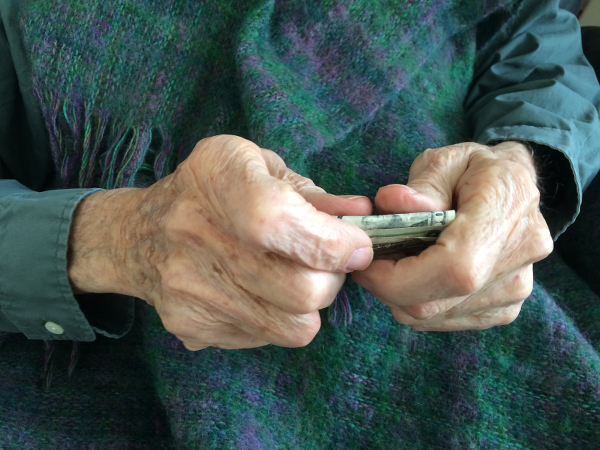 I didn’t want to miss another week of playing cards, walking, making sure he showered and shaved and, or course, forcing him to write a few lines of poetry. Why was it lucky for me? Because today the ice cream truck made its biannual stop at Chelsea. Free ice cream for all! Some of the residents managed to get in line multiple times. The ice cream lady tried to set the record straight but ended up handing over another strawberry shortcake on a stick. Dad chose an Almond Crunch on a stick. I chose an ice cream sandwich. 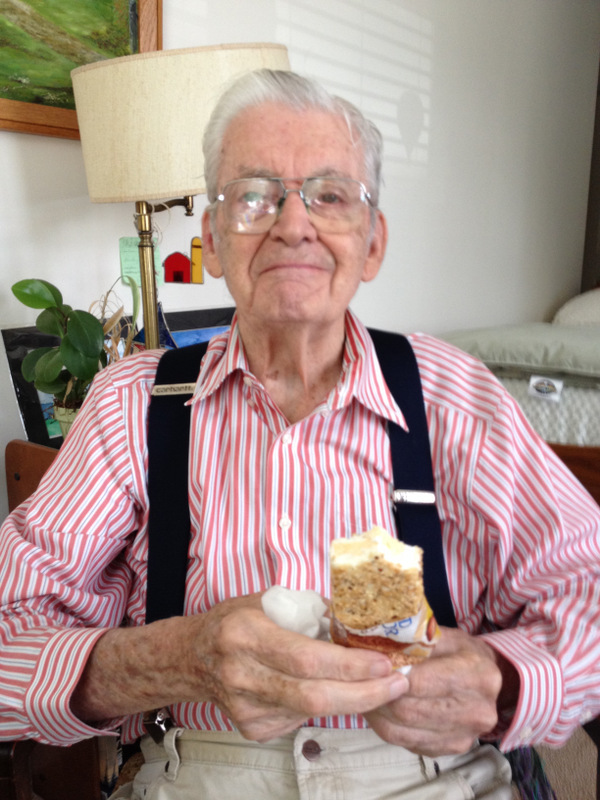 Dad enjoying his ice cream treat. When I arrived, Dad was having lunch in the dining room. John sat across from him reading the newspaper as he ate. A man I hadn’t met was sitting between them in Bunny’s seat. He smiled as i approached and introduced himself as Bill. Bunny had switched to the second serving and Bill had taken her place at the table. Dad looked pretty spaced out and totally unengaged. I chatted at him for a few minutes, then turned my attention to John and Bill. Both were eager to converse. Bill had retired from the Postal Service in Newark where he managed Overseas Mail Deliveries. He loved his job and enjoyed his co-workers. Clearly, his co-workers enjoyed him, too. He riffled through the storage beneath his walker seat and brought out almost a dozen cards that recognized Friend’s Day. He showed each one to me with a huge smile on his face. The messages were caring and humorous. Most of them referred to him as Willy Wonka. I was grateful for the interaction as Dad slowly finished drinking his coffee. Eventually, we headed to his room with two bags filled with paper towels, toilet paper and undies. “Oh, I don’t think I need a shower, do I? I’m sure I took one this morning.” ….. conversation #23 …. we have it every time I visit. He shuffled off to the closet to get clean underclothing before heading into the bathroom. A few minutes later, Dad shuffled out of the bathroom, went to the other closet, the one where his shirts and coats hang. He placed the clean underclothing on the top shelf and headed back to the card table. Conversation #23 repeated again before Dad went back to the original closet to get another set of clean underclothes. While Dad was in the shower, Dan called from the front desk to let me know the Ice Cream Truck had arrived and would be out front until 3pm. Eventually a fresh smelling dad in clean clothes and nicely combed hair sat across from me at the card table. He reached for the cards to deal them. “Oh, Chris…. you know that’s not how that works…. ” Conversation # 14……. “After you finish writing a poem we can go to the Ice Cream Truck, Dad.” A puzzled look crossed his face. “Look through the window. You can see the truck. It will still be there when you’ve written your poem. You can write it about anything, about the ice cream truck, about me forcing you to write poems, about wanting to play cards instead.” I showed him his green book and how it was almost filled with the poems and drawings he has written over the past few years. I would love for every page to be written on and there aren’t that many blank pages left. He reached for a pen and began to write. To make the day right. If I really do care. I guess it must do! While I was away, Dad’s physical therapy sessions had been increased from three times weekly to five times weekly. The positive results were apparent to me. He stood taller and moved with greater agility. I tricked him into walking around the pond more than just a few times by distracting him with a drawn out and slightly exaggerated tale of my recent face to face encounter with a wild boar in an olive grove during one of my morning walks in hills that surround Les Bassacs in Provence, France. I seem to have a knack for attracting Sus scrofa, a species of the pig genus Sus, part of the biological family Suidae. Dad took it all in stride, delighted that I walked each morning and each evening. When I kissed him goodbye I told him that Lou and Dave would be visiting in a few days along with Anna and Howard. He smiled. I treasure these days with Dad.